Between 23 July 1599 and 4 July 1600 Caravaggio painted two large canvases, the Calling of St. Matthew and the Martyrdom of St. Matthew for the side walls of the Contarelli Chapel in S Luigi dei Francesi, Rome--his first public commission. 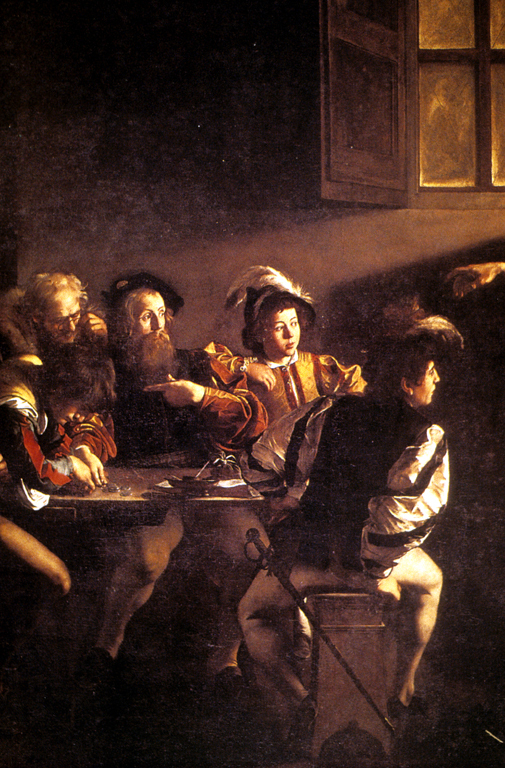 In the two St Matthew histories Caravaggio created a new and emotive combination that remained fundamental to his art: realistic figure types allied to bold chiaroscuro. The fact that Caravaggio always lit his models from above indicates that he was well aware that such lighting enhances three-dimensionality.The Contarelli narratives are great pieces of theatre. Their consummate illusion is to make it appear as if sacred events are taking place in the space of the chapel. It is an impression that is heightened, here as elsewhere, by Caravaggio’s eloquent deployment of both modern and biblical costume. 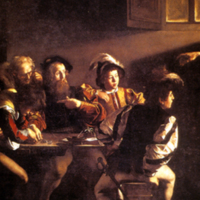 Michelangelo Merisi da Caravaggio (Italian painter, 1571-1610), “Calling of Saint Matthew,” Institute Images Online, accessed April 24, 2019, http://westerncivart.com/items/show/2803.